Open Minds UFO Radio: Dr. Ardy Sixkiller Clarke, a Professor Emeritus at Montana State University, has dedicated her life and career to working with indigenous populations. She is the author of Encounters With Star People, and has a new book coming out in December titled, Sky People: Untold Stories of Alien Encounters in Mesoamerica. As a teenager to follow in the footsteps of two 19th-century explorers, John L. Stephens and Frederick Catherwood, who brought the ancient Maya cities to the world’s attention. 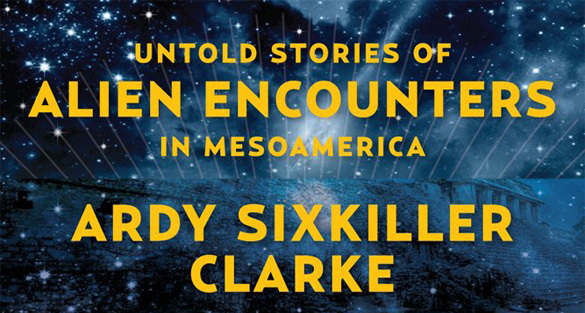 Dr. Clarke set out on a seven-year adventure (from 2003 through 2010) through Belize, Honduras, Guatemala, and Mexico, collecting stories of encounters, sky gods, giants, little people, and aliens among the indigenous people. She drove more than 12,000 miles, visiting 89 archaeological sites (Stephens and Catherwood visited only 44) and conducting nearly 100 individual interviews. For more about Dr. Sixkiller and her work, visit: www.sixkiller.com. Wish I could have went with her.. worthy trek..
My girlfriend and I heard Clarke on a Mysterious Universe podcast discussing her first book. We were so intrigued that we bought the book, but we got about halfway through it before giving up. After a while, it seemed like all the stories were a blur of her having coffee with Native American truckers who had UFO experiences. There’s a lot of compelling information, but a lot of questionable editing as well, eg, referring to a UFO witness in the same story by multiple names. Sure, could be a bad factchecking job or a typo as I’m sure she’s using pseudonyms for many of these people, but as Carl Sagan once said, extraordinary claims require extraordinary evidence. When it comes to UFOs, so many people are immediately willing to discount any evidence as crazy or quack that anyone with a serious interest in investigating and disseminating information HAS to make sure the tales are as bulletproof as can be. Clarke’s first book was entertaining and intriguing, but it soon became a source of amusement rather than edification.